I must buy more T-shirts that give people pause. It’s good for them, I think, and I know it’s good for me. It shakes us up. 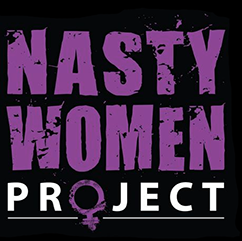 This morning, I wore my “Nasty Women Project” shirt, more for a color coordinated look than as a statement. I always enjoy wearing it but as often happens, I forget I am until someone notices. This morning, it was the pharmacy tech who reminded me. She regularly waits on me and usually calls me by name but not this morning. She just kept staring at my shirt. She paused before asking, “Karen?” Her tone was one of disbelief. I could not help but smile but it was just a small one. “Yes,” was my answer. Admittedly, my tone was a bit sing-song. The tech may not have been crestfallen but she was puzzled. How dare I not be the ailing old woman that she was so sure I was. To be fair, she has seen me on some pretty rough days but the only conversation we ever had was my giving her the information required to purchase my prescription. I presented as a new person to her. Maybe I will replace the one she was so sure she knew. Who knows, maybe someday she will surprise me, too. Let me be gracious when she does.